The Mayor of Yuma signs an emergency declaration. 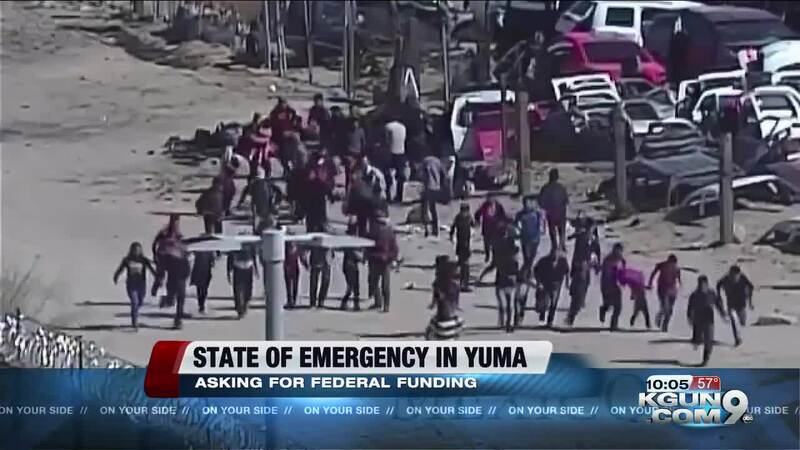 YUMA, Ariz. — Mayor Douglas Nicholls announced a state of emergency Tuesday in Yuma, Arizona, due to the large amount of asylum-seeking migrants being released into the city. Yuma is the first border city to declare a state of emergency in response to the influx of migrant families coming to the U.S.-Mexico border seeking asylum. The U.S. Border Patrol has been releasing migrants to Yuma's shelter system over the last few weeks. "There's an imminent threat of having too many migrant releases into our community, and it's above our capacity as a community to sustain," Nicholls said as he announced the measure Tuesday . The Border Patrol has released more than 11,000 migrant family members at nongovernmental shelters or bus stations along the border since March 19, when it began the practice of releasing noncriminal families directly from custody with notices to appear in court "as a last resort" as apprehensions spiked. Nicholls, a Republican who was elected to be Yuma's mayor in 2014, said he's hoping other border communities will make similar declarations, so they can push together for more federal aid.